Ryan took Friday off and we planned a fun family day at the zoo. We were excited for cooler temperatures (in the mid 90s) but didn't account for the high humidity. Apparently we have grown accustomed to our dry climate as we were a bit sweaty and hot. But had a great time, nonetheless! For the first time, Lily got to feed the giraffes. Both she and Daddy were excited! 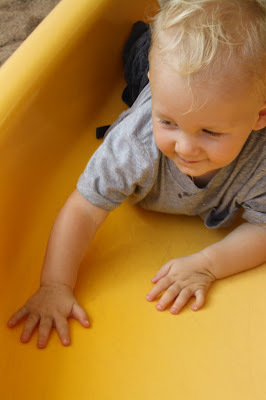 William's first documented slide experience. We've been to our local park a few times this week, and he has loved playing independently on the play structures. Silly boy thinks going down the slide on his tummy is so much fun! 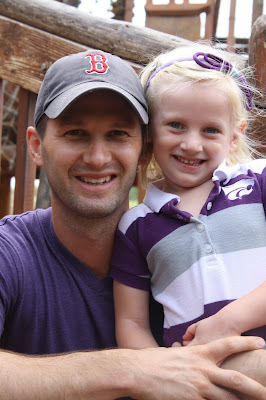 We were thrilled Daddy was able to spend the day with us...activities are always better when he is around! Love those kiddies! !If William isn't a Ryan Jr!! except his curls!